The Governance Report considers the functional aspects of economic governance, the EU's institutional transformations, and their implications for legitimacy. The 2015 edition of the Governance Report takes an interdisciplinary approach to explore how stability in the eurozone and the full integration of the European single market can be achieved, how new methods for consultation and decision-making have influenced the legal and institutional framework of the EU, and how crisis management has affected the Union’s legitimacy. Ultimately, the Report seeks answers to the question of what can make the European Union succeed, fail or muddle through from a governance perspective. The euro crisis, the steps taken to manage it and the resulting transformations have triggered a necessary process of reconsidering economic governance in the European Union. This volume examines the many open political, legal and economic questions related to the functioning and fundamental structure of the EU as a whole and the economic and monetary union in particular. In doing so, contributions from different academic disciplines take stock of the current situation, shed light on the dilemmas and challenges that must be recognised and addressed, and explore options for the way forward. 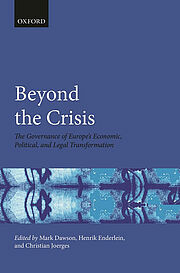 Beyond the Crisis: The Governance of Europe's Economic, Political, and Legal Transformation is also available on Oxford Scholarship Online. In recent years, measures and instruments for crisis management have been constantly updated to keep the eurozone from breaking apart. The Governance Report 2015 introduces the concept of exploratory governance to understand such decision-making processes, which tend to operate under uncertainty and aim at avoiding mistakes. The unknown character of frameworks adopted under exploratory governance leads to numerous challenges and eventually requires a point of evaluation, when actors must choose between three uncertain paths: abandoning the innovative policy, continuing with a current arrangement, or correcting the current direction. From an economics view, proper functioning of the EU’s economic and monetary union (EMU) is a top priority. A key driver of the eurozone crisis was the incapacity to bring together different economic systems within a single currency. Here, the overarching challenge is to find the right amount of integration for the EMU to function properly. Finding this balance entails at least two more challenges: resolving the tension between the optimal circumstances for completing the internal market and the structural differences within Europe, and addressing the tension between independence in fiscal and financial policy and co-ordination in a monetary union. Decision-making in the EU has always been complex, agreed upon either through the supranational "Community method" or through intergovernmental agreements controlled and implemented by national governments. Now, with a growing number of institutions and instruments, economic governance under a new "coordinative method" combines highly centralised supranational intervention, particularly in budgetary policy, with intergovernmental control of key political decisions. As a result, a major challenge is to seek a structure for legal and political accountability in EU economic governance that will allow citizens to contest and challenge the decisions shaping their lives. The eurozone crisis has only intensified the conflict between economic integration and political legitimacy in the EU. The question now is how to move forward. When it comes to the institutions and instruments adopted in response to the crisis, the EU has two options: normalisation or contestation. The more promising alternative is to recognise diversity, focus on compatibility, and use law to catalyse and civilise contestation. By doing so, conflicts and trade-offs may be dealt with constructively, helping return the European integration project to legitimacy. To find out more, order The Governance Report 2015 and Beyond the Crisis: The Governance of Europe's Economic, Political, and Legal Transformation. The indicators developed for the 2015 Governance Report reveal how numerous economic and political issues faced in the European Union have evolved over time. By showing which countries have moved closer together or further apart and in which issue areas, the indicators also reveal whether such trends have been more pronounced in certain clusters of countries, or 'convergence clubs'. Additional indicators measure associations between macroeconomic trends and aggregate public opinion, as well as during distinct time periods. Data from the indicators created for The Governance Report 2015 as well as any images generated by the interactive tools are free to use for research purposes. Please use the following citation: Hertie School of Governance (2015). The Governance Report 2015: European Union Indicators. Hertie School of Governance: Berlin. Read more from author Mark Dawson at EurActiv and The World Post, and from author Christian Joerges at UCL European Institute’s Britain and Europe blog. Albert Weale, Professor of Political Theory and Public Policy at University College London School of Public Policy and Beyond the Crisis contributor, reviewed The Governance Report 2015.